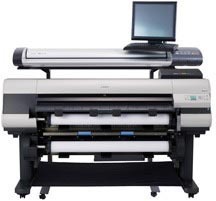 A 44-inch wide powerhouse scan-to-copy / file / e-mail system designed to enhance productivity for medium to large workgroups, with dual media rolls and high speed throughput, the imagePROGRAF iPF825 MFP Pro is a complete production imaging solution. Designed for AEC, CAD and GIS technical documents and general use, the iPF825 MFP Pro provides a fast and effective system for copying, archiving and distributing maps, drawings, renderings, site and facilities management plans, design and layout proofs, posters and more. With true 1200dpi optical resolution, CIS scanning technology for incredible line definition and accuracy, and room for documents up to 44″ wide, the iPF825 MFP Pro is a versatile imaging solution. And with dynamic preview and a large, simple-to-use touch-screen interface, one-click scanning/copying has never been easier. Comes standard with the ability to scan to PDF, JPEG, and TIFF file formats. Equipped with dual media rolls, the iPF825 MFP Pro eliminates the cause of many bottlenecks in busy printing environments. Automatically switch between different media type, sizes or use two rolls of the same paper for printing of large, consecutive runs. With a 160GB hard drive, excellent media handling, and on-board support for HP-GL/2 and HP RTL files, the iPF825 MFP Pro is a complete and easy-to-use imaging solution for any professional with a need for intricately detailed full-colour renderings, CAD drawings, GIS maps and other large-format output. Exceptional image quality is accompanied by breathtaking productivity, with draft A0 prints in 45 seconds and A1 in just 24 seconds. High capacity 330ml and 700ml “hot swap” ink tanks are used, which can be replaced during production for non-stop productivity, as well as borderless printing to save you time on finishing. Canon’s L-COA image processing technology and 10/100Base-T/TX Ethernet compatibility ensure stunning high-speed reproductions on everything from architectural plans to geographic information. For imagePROGRAF Printer Driver. For printing from PostScript applications such as Adobe Illustrator or QuarkXpress, please use a PostScript compatible RIP package. For a list of Canon recommended RIP packages, please consult with Canon Alliance and Industry Market list of RIP vendors. 2. The maximum printable length varies depending on the application, OS, and RIP used. 3. For AutoCAD or AutoCAD LT 2005, 2006, 2007, 2008, 2009, 2010, 2011.